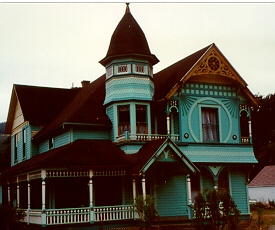 This Queen Anne style house was built in 1902. It is listed in the Statewide Inventory of Historic Sites and Buildings. 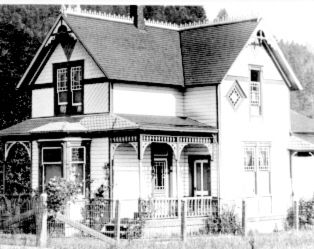 The house has a variety of features and exterior textures with multiple ornamented gables and a tower rising above the main entrance. The home is currently a private residence and is not open to the public. Charles Hasard moved to Oregon in 1880 and was employed as a carpenter for the Oregon and California Railroad. He arrived in Drain in 1892 and begin work as a hotel keeper. Later he bacame a farmer and merchant. Hasard was appointed a U.S. Land Commissioner in 1902. Professor Van Scoy was the last administrator of the Central Oregon Normal School.